I'm seeing an alignment of factors that I like as an opportunity to go short the Australian Dollar (AUD): historic price trends and a key falling commodity price. As you can see, it's sitting at just about $1 AUD to $0.80 USD. In the recent past, it hit resistance at this level and then fell. A big part of the reason for that is the effect a stronger AUD has on Australia's exports: it makes them less competitive on the global stage. This harms Australia's economy, which is a situation that invites intervention by the Reserve Bank of Australia to bring the currency down. Factors at work here: rising prices led to rising production, which has now led to increased supply, which will lead to lower prices; a forecasted slowing Chinese economy, the main buyer of Australia's ore, meaning less demand, further bolstering supply and lowering prices; possible imposition of steel tariffs on Chinese steel here in the U.S., further weakening China's demand for Australian iron ore. Put all of this together, and AUD looks ripe for a fall. I've circled the entry that I've identified per my method, which will simultaneously explain why I'm not going short AUD/USD at this time in favor of this trade. As you can see, my chart is a daily (24 hour) chart that is fairly clean, including just three indicators: a 13 and a 34 period exponential moving average, and a 50 period simple moving average. For the purposes of identifying an entry, it's the 50 SMA that's the most important, with a close above or below it indicating a potential long-term change in trend. At this stage, the 13 and 34 EMA indicators serve as initial stop-loss order points, and I use an initial risk of 1% of the net asset value of my portfolio to determine the size of the trade from this initial stop-loss point. 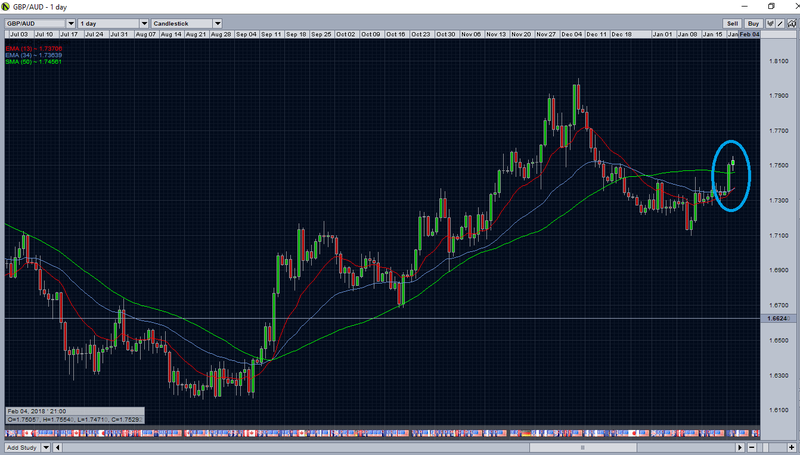 As the trade develops, the two EMA indicators just help me to keep an eye on the momentum of the price action. That's the reason why I'm not going short AUD/USD at this time, despite it having served as the prompt for exploring AUD pairs: the entry signal is a long way from appearing at this point in time, despite the historical significance of the current exchange rate and the economic headwinds AUD now faces. Basically, what happened was that I noticed the resistance AUD/USD long was running into, so I began scanning other AUD pairs. 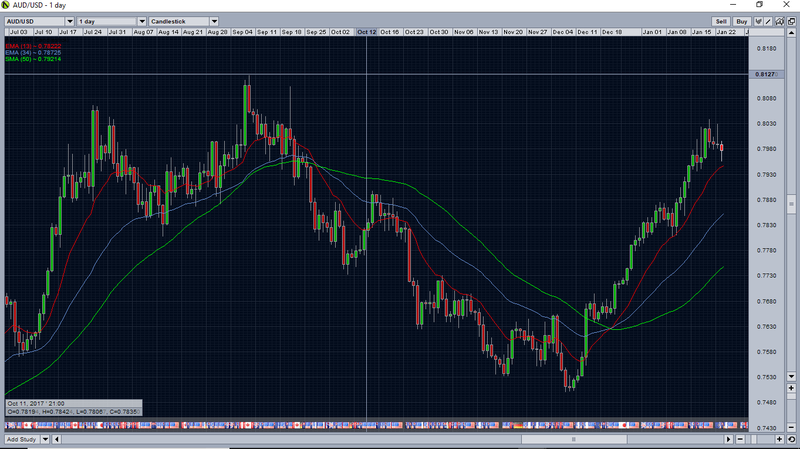 Most of them look identical to the AUD/USD chart, save for GBP/AUD. When I spotted that potential entry, then I began searching news articles about AUD. 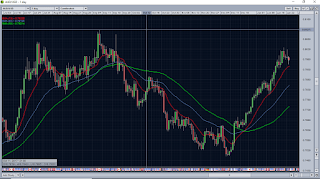 That led to the discovery of the key factors that can influence the exchange value of AUD I mentioned above, which when combined with recent good news on the U.K.'s effort to leave the European Union, possibly sets the stage for a continued rally of GBP against the AUD, a possible continuation of the trend only recently interrupted. This is a highly uncertain trade as most of the support for GBP is political in nature, and it will probably spend some time in the red initially. My entry is also based entirely on a quick spike above the 50 SMA, which could reverse rapidly and negate the trade entirely. That is why I'm risking a maximum of 1% of my account on it; limiting losses is a key tactic for trading success, in any market, and a loss of 1% will not cripple an account. I will go short AUD/USD if in the future a similar pattern develops and economic factors suggest it could go for a nice, long run. As you can probably guess then, I don't favor short term trading in Forex (admittedly, what amounts to "long term" here might be perceived as short in another market). I've done day trading before, and while at times it was very profitable, most of the time it was very frustrating, and all of the time it brought on burnout quickly. This method has me at my trading terminal once or twice a day, once in the morning and sometimes again around the close of each trading session (21:00, or 9pm, Pacific time) for about ten to twenty minutes, maybe a half-hour if I find several interesting prospects in a single sitting. I definitely prefer the mornings, however, as a full recipe mug of Bulletproof Coffee and Forex go together nicely, I think. If you're new to Forex, I have to say, don't just dive into this stuff. This post might make it sound easy, but trust me, Forex is hard. Beyond the technical setups and background research that goes into a successful trade is a reality of how it often plays out that makes this tough stuff to stomach: you will lose the vast majority of your trades. Profits in Forex are often all about the handful of winners that you allow to run while losers are mercilessly cut short. That is also the other extreme difficulty of doing this stuff: it is hard to make yourself let a winner run! When most people see gains starting to appear, they want to take them off the table. When gains begin to shrink as momentum temporarily fades, people really want to take the trade off the table and keep what's left! You can't do that though if you want to succeed in Forex, you have to just let the trades play out. For me, exit is when either my initial stop-loss gets hit, or the opposite condition appears that initiated the process of exploring the trade in the first place after a good, long run into profit: a cross over the 50 SMA in the opposite direction. There will often be a lot of ups and downs on the way there, but you just have to let the trade do what it will. Fortunately, there's a way to explore this market and try out strategies without risking a penny. 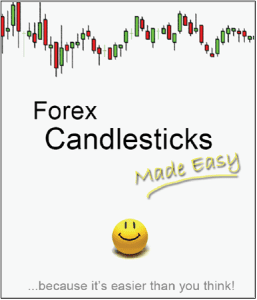 My broker, Oanda, offers a free practice account, which uses the actual data from the Forex market, but it's a "game" account with fake money. You can register for a free Oanda practice account here.